The fun of fishing seems to transcend all ages, providing excitement and thrills for great-grandparents and great-grandchildren alike. The lakes and rivers of New Hampshire's Lakes Region provide endless opportunities and memories for everyone. Are you planning to go out in pursuit of the small mouth bass and lake trout of Lake Winnipesaukee? 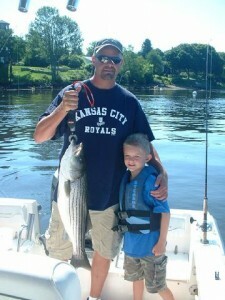 For first-timers, especially, consider a day or half day with one of the professional fishing guides on the big lake. They won’t give away all of their secrets, just enough of them to make sure that you’ll enjoy yourself. The NH Fish and Game Dept. website offers plenty of information for Lakes Region anglers, including seasonal bi-weekly N.H. fishing reports, license and tournament info, a schedule of fishing classes, and more. For winter visitors and residents, ice fishing is a great way to get out on the lakes. You'll find ice fishing info, including links to videos, tournament info, lessons schedules, and safety info on the NH Fish and Game ice fishing page. Fishing is part of the many "whys" folks embrace the New Hampshire life style, especially here in the Lakes Region. We encourage you to experience and re-experience an activity that will never grow stale; you can always recall a day on the water. For more suggestions about fishing in New Hampshire's Lakes Region, contact the Spencer-Hughes Real Estate team. We're not just local real estate experts; we're local residents!